Many people encountering the Earth-change predictions found in Edgar Cayce's readings are puzzled by his extraordinary psychic abilities. And professional geoscientists are surprised by the global scope of the geophysical information that Cayce channeled from nearly a dozen or so different sources over a period of nearly 44 years. When told that one of Cayce's best sources of Earth change information was an archangel known as Halaliel, for example, some would press for details, while others would simply turn away. Similarly, when told that the second best source was a reincarnated woman who was told in her reading from Cayce that she had been "...a daughter of the Inn Keeper, that stood by -- and was the second of those that took the Babe into their arms...," some people accepted the information while others rejected it. Numerous geophysical predictions from the two sources just above were given which dealt with serious catastrophes like the destruction of America's west coast cities and New York City, the changing of northern Europe in the twinkling of an eye, the greater portion of Japan sinking into the sea, and the shifting of the poles of Earth's rotational axis, all to happen soon. Now while all of these specific Earth changes have been described and evaluated as to their validity in our book, "Earth's catastrophic past and future," not a single one of them has actually occurred, until now. This particular Earth-change prediction was channeled by Cayce on January 21, 1936 and its realization took place - to a certain degree - during a three-month interval between February 11 through May 14, 2010. Although the particular segment of the reading itself is given below, note that there is one caveat to the accuracy of the reading to consider. Sometimes, in the transmission of information from a psychic source to Cayce's voice box, factors - detailed in other readings - could cause a "wavering" of the truth of the words themselves. This apparently occurred, in the reading passage that follows. This reading was given for a 50-year-old male, a Protestant and an accountant. Present at the reading were Gertrude Cayce (the conductor of the reading), Gladys Davis (the stenographer), Estella Smith, Jack Tobin, Jr., and Hugh Lynn Cayce (Mr. and Mrs. Cayce's oldest son). The requester, a Mr. 270, was in San Francisco, California for the reading. Q) What is the primary cause of earthquakes? Will San Francisco suffer from such a catastrophe this year? If so, give date, time and information for the guidance of this body, who has personal property, records and a wife, all of which it wishes safety. A) We do not find that this particular district (San Francisco) in the present year will suffer the great MATERIAL damages that HAVE been experienced heretofore. While portions of the country will be affected, we find these will be farther EAST than San Francisco - or those SOUTH, where there has NOT been heretofore the greater activity. This reading then goes on to conclude with the fragment given at the top of this section. Note that the predictions in the first two paragraphs of the answer proved to be accurate, as documented in 1996, in Hutton's book, "Coming Earth Changes," (A.R.E. Press). Earthquakes are indeed caused by internal movements “about the Earth,” and no earthquakes affected San Franscisco in 1936. This suggests that the information for the entire reading fragment of interest is from a source high enough to make credible predictions. This source might even have been as high as the universal, or cosmic-consciousness source. We would not think of it as being lower than the archangel source level. The predictions of Earth changes given in the reading fragment under analysis seem to be reliable and with but one example of wavered truth. (The use of the name Soufriere Hills for Pelee in the reading.) This reading fragment, however, is believed to have true predictive capability. Here is a December 2009 activity report for Soufrière Hills volcano on the Caribbean island of Montserrat, prior to its catastrophic eruption of February 11, 2010. This report indicate something of the increasing activity of the volcano as Soufrière Hills volcano approached February 11, 2010. MVO reported that during 11-19 December activity from the Soufrière Hills lava dome continued at a high level. Observations with a high-resolution thermal camera revealed multiple rockfall channels on the W, NW, N, and NE flanks of the lava dome. Frequent pyroclastic flows were noted on the northern flank; pyroclastic flows traveled 3 km W down Gages Valley into Spring Ghaut, as far as 4 km NE down the White River valley, and as far as 2 km in Tyers Ghaut (NW). Occasional pyroclastic flows descended Gingoes Ghaut (S) and Tar River valley (E). Heavy ashfall was reported in many inhabited areas of Montserrat. Ashfall also occurred on many other Caribbean islands, as far as Puerto Rico (400 km ENE). The Hazard Level remained at 4. According to a news article on 29 December, about 45 commercial flights scheduled to arrive at or depart from Puerto Rico were cancelled due to ash in the area. 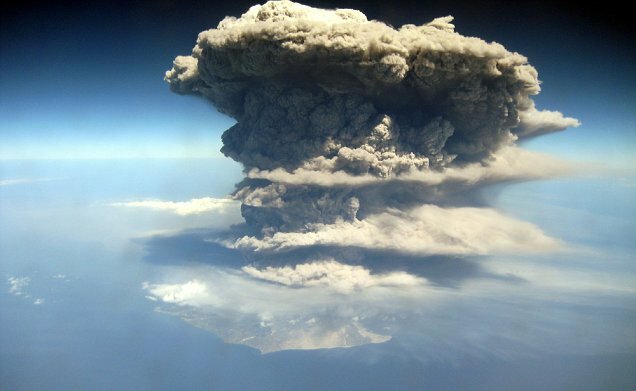 The Hutton Commentaries (THC) addressed this increasing volcano activity in bulletins of July 3, 2005, and January 17, 2007. Both of these bulletins indicated that the "greater activities" at Mt. Pelee in Martinique, required by the prediction of Cayce reading 270-35, were to occur before "inundations of earthquakes" from Salt Lake City, to southern Nevada, to coastal southern California that were to take place sometime in the three months following Pelee's greater activities. But no special notice was made about the additional prediction about "...But these, as we find, are to be more in the southern than in the northern hemisphere." Recall here that Mt. Pelee had erupted in 1792 and 1851. Then, in May, 1902, it suddenly erupted again when masses of lava, pumice, and hot ash burst from the south side of the volcano. In one day 30,000 people died. Oddly, it seems, in that same year of 1902, 15,000 people lost their lives in the eruption of Soufriere volcano on the nearby island of St. Vincent: that is, not at Soufriere Hills on Montserrat. The last eruption of Mt. Pelee occurred in 1929. It remained active for three years, but no lives were lost. One can conjecture that once pole shift begins, and Earth's tectonic plates and mantle bulges get moving, Mt. Pele will once again begin to respond with "greater activities" than those that occurred most recently, in 1929. Then again, perhaps the current greater activities of Soufriere Hills volcano is taking the place of that predicted for Mt. Pelee, lying just 150 miles northwest of Martinique. We know that psychic data from Cayce's sources were sometimes "wavered." This was indicated in our book on page 484, where we explored two early readings on Cayce's psychic sources. (Q) Explain: "By the suggestion the subconscious may be wavered by the forces that are brought to bear on the subconscious to reach conscious mind, just as we have in a purely mechanical form." (A) In the wavering of forces as applied from the subconscious to the conscious mind, first we must take into consideration that conscious mind is of the material world a part. The subconscious mind may only be fully understood when viewed from the spiritual viewpoint or aspect. The conscious mind rarely gains the entrance to truth in the subconscious, save in rest, sleep, or when such consciousnesses are subjugated through the act of the individual, as in the case of Edgar Cayce, through which the subject matter was given. The illustration as given of mechanical way, that is as appearance of stick in water appears bent. When the consciousness views subconscious forces they appear wavered or bended, when viewed from wholly a material viewpoint, whether from the dream in sleep, or viewed by a conscious mind or material mind of truth from trance or from the subconscious condition. Hence in the sleep we may have the superseding appearance of the consciousness and thus waver the appearance of truth obtained, or we may have the suggestion as is given to a mind directing the truth to be obtained from subconscious forces bended in such a manner as to give the wavered aspect to the truth as given. In such a manner, or in one of such manners, then do we see the wavering often (not always) of truths obtained by a consciousness from the subconscious forces. Just as illustrated in the mechanical manner as given in subject matter. Thus, a slight wavering of Cayce's perception of the location of greater activities occurring at a Caribbean volcano, as given in reading 270-35, might have been wavered and what was given as Mt. Pelee might really have been Soufriere Hills on Montserrat. The Greater (Explosive) Activity of Soufriere Volcano, Surrogate For Pelee, And The Beginning of The Three-Month Interval To Include "Inundations By the Earthquakes"
Here begins our narrative of the predicted beginning of the three-month period in reading 270-35, as related in our THC bulletin below of February 22, 2010. Was Soufriere Hills Activity Of February 11 THE Signal? The massive eruption of Soufriere Hills Volcano on 2/11/2010, as seen from a jet plane full of holiday travelers. THC is still waiting for a signal for the beginning of a sequence of earthquakes and their effects predicted to occur in the western states, and also elsewhere in the southern hemisphere. And considering that the volcanoes of Vesuvius and Pelee (on the Caribbean island of Martinique) are dormant, perhaps Soufriere Hills volcano, about 140 miles from Martinique, is a surrogate for Pelee. Was the recent strong activity of Soufriere Hills the signal that THC has been anticipating? Maybe not. The activity on February 11 was related mainly to a collapse of the volcano dome on Montserrat. But this collapse was produced by the extreme activities of the vulcanian eruptions of the day. What produced them? Deeper magma-flow activities. What could such deeper flows imply? That Earth's crust at the eastern edge of the Caribbean tectonic plate is beginning to respond to deep magma flow, and that such flow there might lead to deep magma flows and earthquakes along weak spots in the crust elsewhere. Thus, this volcano may be a sign for the reactivation of Earth's magma-surge channels, as discussed on pages 98-102 of our book, Earth's Catastrophic Past and Future. Here below is the latest on the degree of "greater activities" at Soufriere Hills. One week after the events of February 11th 2010, the MVO now has a good understanding of what happened and the areas that were affected. The large and extensive pyroclastic flows that moved to the northeast extended the original coastline by a maximum of 650m. Pyroclastic flow deposits are approximately 15 m thick in the Trants region on the northeast coast. There were a number of explosions and pumice flows and ballistic pumice clasts were formed during the event. Violent northward-directed pyroclastic flows razed many buildings in both Harris and Streatham down to their foundations, and trees have been felled by pyroclastic surges in the Gun Hill area and at the head of Farm River in Bugby Hole. There is a large crater in the summit of the dome and a deep collapse scar in the northern side that is separate from the crater. It is currently unclear whether there is a new dome growing inside the crater. However seismicity is low and small, occasional rockfall signals and hybrid earthquakes are being recorded which could be consistent with moderate dome growth. We move now to the first "inundation by the earthquakes" that occurred in the southern hemisphere, 16 days after February 11, 2010 -- the date of Soufriere Hills' greater activity. This great, southern hemisphere earthquake, with its many powerful aftershocks and Pacific basin-wide tsunami, represents a perfect fulfillment of one of the predictions of Cayce reading 270-35. This light earthquake was in the right place and time for the prediction, but there were no follow-on quakes whatsoever. The 16 March 2010 Pico Rivera M4.4 earthquake shown as a red filled circle. The 1987 ML5.9 Whittier Narrows earthquake shown as a red star. Historic seismicity shown as yellow stars. Figure prepared by Bob Dollar. This strong earthquake occurred 29 days after the explosion of Soufriere Hills volcano. 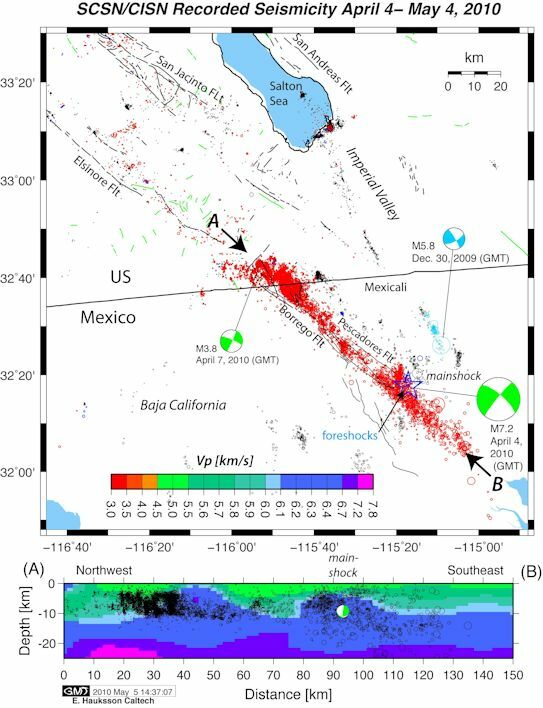 near The "Southern Coast of California"
This huge "inundation by the earthquakes" is seen in the following map's thousands of aftershocks. Again, we have another fulfillment of the Cayce reading. We follow now with a list of southern hemisphere earthquakes of M5.0 or greater that have occurred in the three-month window that started on February 11, 2010. These quakes are primarily singular events, not part of swarms. The Chile swarm that followed the M8.8 mainshock are presented in the third image above, between 2/27/2010 and 3/1/2010. Following March 1st up to April 2nd, there were 170 M5.0 and above earthquakes in the southern hemisphere. Additional earthquakes between April 2 and May 10 are presented in the list below, along with a few from Utah. 2010 April 11 5.5 86 -5.3 152.3 New Britain Region, P.N.G. 2010 April 22 5.1 110 -4.54 144.74 Near North Coast Of New Guinea, P.N.G. Magnitudes of quakes in southern Nevada during this period were trivial. For example, there was only a single M3.5 quake detected in Scottys, Nevada which is about 50 miles NW of Las Vegas. During a three-month interval following increased activities at Soufriere Hills volcano on the island of Monserrat, two significant earthquake swarms ("inundations by the earthquakes") occurred as predicted in Edgar Cayce psychic reading 270-35. One of these swarms was in Chile, the other was in Baja California-Mexico. These events were foretold in a Hutton Commentaries bulletin to subscribers. That bulletin interpreted the Cayce reading in question by assuming that although Mt. Pelee on Martinique was mentioned by Cayce's source as being the offending volcano, some 74 years ago in 1936, geological events seemed to point to the Soufriere Hills volcano as the most probable one today. Because the original Cayce prediction required that inundations by earthquakes should have occurred in Utah and southern Nevada -- which they did not do -- shows that that part of the prediction was not fulfilled. The reasons why this did not occur will be examined in a further study.